one-hundredth of a second, it would require an objective whose diameter is of the order of forty feet — which, of course, is out of the question. It is, however, not altogether out of the question to construct an interference apparatus such that the distance between its mirrors would be of this order of magnitude. But it is not altogether improbable that even some of the nearer stars are considerably larger than the sun, and in that case the angle which they subtend would be considerably larger. Hence it might not be necessary to have an instrument with mirrors forty feet apart. In addition it may be noted that it is not absolutely necessary to observe the disap|>earance of the fringes in order to show that the object has definite magnitude; for if the visibility of the fringes varies at all, we know that the source is not a point. For, suppose we observe the visibility curve of a star which is so far away that we know it has no appreciable disc. The visibility curve would correspond to a straight line. There would be no appreciable difference in distinction of fringes as the distance between the slits was increased indefinitely. 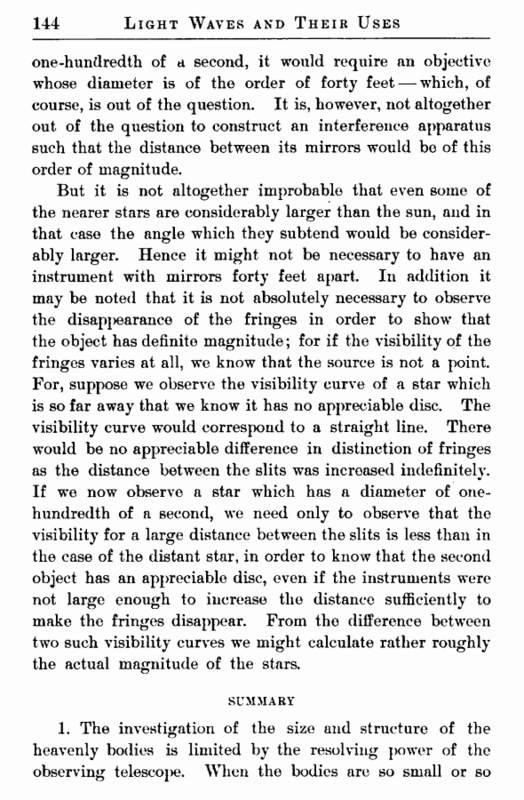 If we now observe a star which has a diameter of one-hundredth of a second, we need only to observe that the visibility for a large distance between the slits is less than in the case of the distant star, in order to know that the second object has an appreciable disc, even if the instruments were not large enough to increase the distance sufficiently to make the fringes disappear. From the difference between two such visibility curves we might calculate rather roughly the actual magnitude of the stars. distant that this limit of resolution is passed, the telescope can give no information concerning them. 2. But an observation of the visibility curves of the interference fringes due to such sources, when made by the method of the double slit or its equivalent, and properly interpreted, gives information concerning the size, shape, and distribution of the components of the system. 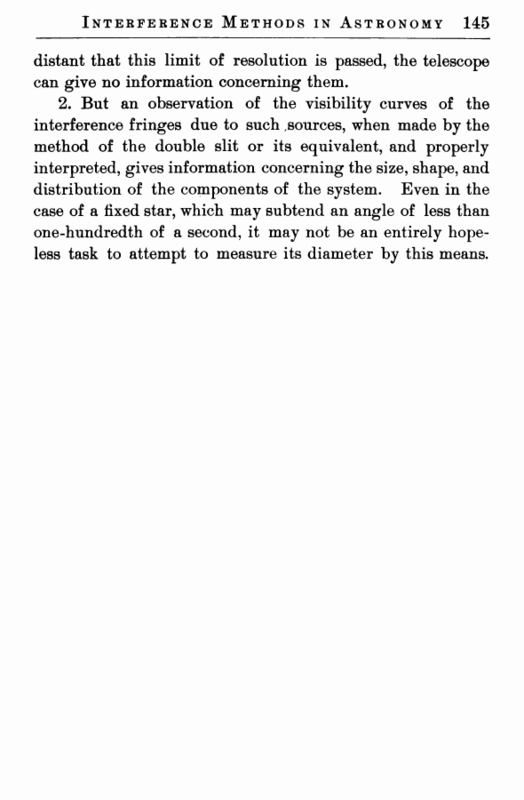 Even in the case of a fixed star, which may subtend an angle of less than one-hundredth of a second, it may not be an entirely hopeless task to attempt to measure its diameter by this means.